I want to begin compiling angler reports about the river user conflicts experienced with floaters and fishermen in the catch and release section from Pretty Boy Dam Rd through Bluemount Rd. If you would like to report any incidents of floaters, (tubers, kayakers, ect…) affecting fishing or would like to express your opinion on the subject, please drop us a line at info@backwaterangler.com with a description of an incident. Please include your name, address, phone # and how often you frequent the Gunpowder River and what time of year the incident occurred. Anglers need to make ourselves heard if we hope to alleviate this problem in future years. Take a few moments to express your opinion. Note: Some of the responses will be used on this website and/or used in a letter to Maryland DNR and Gunpowder State Park Officials. Thoughtful respectful responses, (no rants please) will help us lobby to make changes to prevent future river user conflicts. Thanks! This entry was posted in news on September 29, 2007 by Jason du Pont. The following is a review of the Bauer MacKenzie Superlight Series by Scott Burns. Thanks Scott! I have fished one of these reels for two years now- fished pretty hard. Smooth drag. Takes a lickin and keeps on tickin. A great reel for the price. This entry was posted in gear, reviews on September 27, 2007 by Theaux Le Gardeur. The water level took a downward turn and leveled off at 24 Cfs on Monday morning to allow shocking surveys to take place on the river. 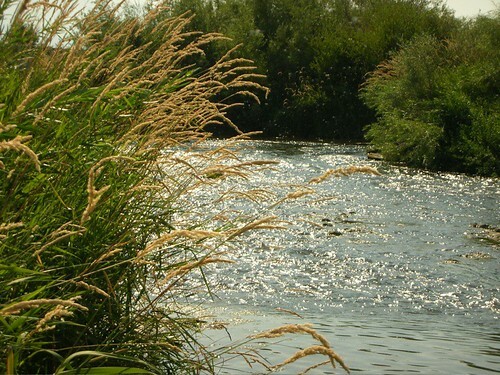 The flows will be kept at current levels until surveys are finished on Wednesday the 26th of September. Flows should return to higher levels by Thursday the 27th, based on water needs in Loch Raven Reservoir. This entry was posted in fishing report on September 25, 2007 by Jason du Pont. Cold Snap Brings An End To The Tubers! Fall weather has arrived in North Baltimore County. The morning’s air temps began rising from 44 degrees at 7:30 am and river temps should remain below 60 degrees in the upper river. A bass angler on Prettyboy reservoir stopped in to comment that the surface temp on the reservoir dropped 8 degrees from last week. Water temperatures south of the confluence of Little Falls are now at safe fishing temps to the Sparks Rd access. Float trips have accounted for some nice fish outside the catch and release section. Long riffles, quiet water and summer float traffic will end even in the most heavily floated stretches as the cool weather continues. This cold snap will mean quiet water for anglers accessing areas south of Bunker Hill Road that have been crowded by weekend tubers and kayakers all summer. York, Big Falls (parking is still open at bridge), and Blue Mount Rd are all now viable options for fly fishing with few interruptions or intrusions. Warm fleece pants, socks and shirts will be needed as water and air temperatures continue to drop over the next weeks. The colder water temperatures should get the trout feeding as the start of their pre-spawning cycle nears. 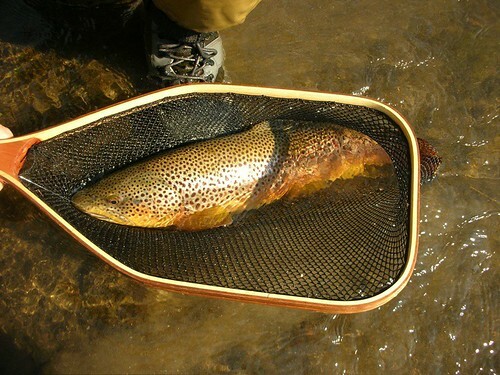 Dry fly fishing is providing good results for anglers fishing caddis, midges, adams and small olives. Size 18-20 Comparadun patterns in gray, rust, cream and olive have worked well for many anglers. Stop by the shop to check out some hot new caddis patterns to arrive early this week. 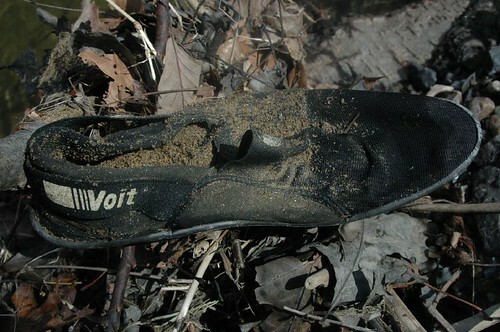 We have a snow shoe olive pattern that when combined with the Magic Pen Floatant and Dry Shake is nearly unsinkable. Terrestrials are still getting bites, but hoppers can be a great indicator for nymphing caddis pupae and pheasant tails. Streamers will begin to catch more of the larger fish for anglers willing to fish areas with lots of structure and deeper water. Wet flies and soft hackles are also good choices for anglers looking to swing flies and cover more water. Water levels will be dropped on September 24-26 for the electro-shocking survey. If you have not netted a large Gunpowder brown yet, now is the time to assist MD Fisheries staff in the annual shocking survey. This entry was posted in fishing report on September 18, 2007 by Jason du Pont. The anglers who watched the Canoe Hatch video of the Ausable River got a wrong first impression of Michigan’s trout rivers. I got phone calls and emails at the shop about how amazed people were that we not only kept our cool, but caught fish. One reason I didn’t mind the insanity, was that we rarely saw anyone else all week long. Except for the “Holy Water” and “Big Water” we never saw another angler fishing on any of the branches of the Ausable. Michigan has so much good water, that I didn’t want to show only that day, which was the exception for the week. The North Branch of the Ausable was such a quiet place, even the riffle water blended with the sound of shore grasses blowing in the wind. On one of the last days an afternoon chill began ushering in thoughts of Fall, the journey home to Maryland and fishing the Gunpowder again. I tied on a favorite fly, an olive bodied, gray X-caddis to better work the riffles. As the sun dropped behind the treetops, fluttering gray wings and dancing bodies on the water brought splashy rises to a caddis hatch. A short while later I had landed over ten fish, used a good portion of my Frogs Fanny and felt the air getting colder. The seven and eight inch brookies fought hard, while the ten inch browns bulldogged toward structure. I lost all interest in nymphing, streamer fishing and what the big fish were doing. I was placing my powdered gray caddis near the naturals and watching it disappear in a white foam surge. As things began to slow Matt hooted from a stand of trees and we left the water satisfied with the quick hatch as darkness closed in on us. The footage shows grassy riffles, weed choked runs and plenty of brush in the water. The North Branch brookies were aggressive and more orange on the belly than the ruby pink you see on brookies in Maryland. The buttery browns, weedy beds and clear water of this stream made it one of my favorites of the trip. A slow approach, minimal casting and proper fly selection was rewarded with wild trout in some great water. When leaving home waters to experience something all together new, yet finding something all too familiar, a strange realization occurs. I will say that traveling and encountering a regional treasure can put into perspective an often underrated fishery that exists much closer to home. The pursuit of wild trout in beautiful surroundings is easily taken for granted when those trout are not large, abundant and easy to catch. Although the challenge in the simple pursuit of merely catching a trout, any trout, while far from home can be the most rewarding experience. This entry was posted in fishing report, video on September 18, 2007 by Jason du Pont. The Gunpowder river is flowing at 86 Cfs and is 61F to 63 F throughout the catch and release section. Tricos sized #22 and Blue Winged Olives sized #18-20 have been accounting for a lot of steady rising fish before 10:00 AM between Masemore RD access and Bunkerhill RD. Caddis sized #16-20 have been working great above Falls Rd access. 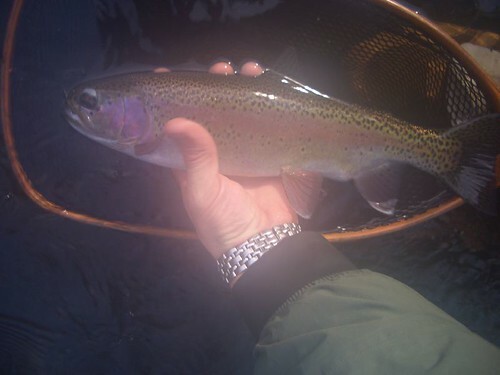 Hoppers and small streamers in the late afternoon should round out your offerings. Quite a few rainbows have been reported in the gorge area this week. The recent rains did not affect water clarity or levels today but the clouds should help to make the fishing more productive.Remember that we’re on a tailwater, so even if we get a shot of rain later in the week that would otherwise muddy the freestones in the area, water levels don’t typically move on the Gunpowder as quickly. So by all means, go fly fishing on the Gunpowder river this week and say hello to the herons as you move upstream. This entry was posted in fishing report on September 11, 2007 by Theaux Le Gardeur. This video, my first on the site, (thanks Jason) was shot mid-morning in late August and indicates that more folks should be fly fishing late in the season on the Gunpowder river with long leaders, tiny flies and a stealthy approach. This entry was posted in video on September 8, 2007 by Theaux Le Gardeur. As of August 27, 2007: On September 5, 2007, the contractor is scheduled to start work to replace the bridge on Big Falls Road between Bernoudy and Monkton Roads. The bridge will be closed for approximately 13 months (280 working day contract). This is the bridge over the Gunpowder River near the Bluemount Quarry. This entry was posted in news on September 7, 2007 by Theaux Le Gardeur. No fish in the Gunpowder? Join Maryland Fisheries Biologists in a rollicking sampling tour of the Gunpowder river. The following schedule will be kept firm. The only exceptions will be if electrofishing conditions are unacceptable (ie. Flooding, muddy water, or torrential rain). Volunteers should check with me (cgougeon@dnr.state.md.us) at work (410) 442-2080 or on my cell phone (410) 570-5718, a day or two prior to the work date to confirm that the survey date will go as planned. All meeting times will be at 9:30 a.m. at the planned meeting location. Bring chest high waders if you plan to assist us in the stream. Those not able to assist with the electrofishing are very welcome to attend and observe from the bank. Sampling usually extends to about 3:00 p.m. each day. Please call or email to confirm the dates that you plan to attend, only if you will assist in the electrofishing activity. Confirmations will allow us to ensure enough help will be available each sample date. 09/26/07	Bluemount Rd. Hiker/biker trail at Bluemount Rd. This entry was posted in news on September 6, 2007 by Theaux Le Gardeur.